Today I have March’s Beauty Box 5 to show you! Beauty Box 5 is a monthly subscription service that delivers five cosmetics samples to your door for $12 a month. The theme of this month’s box is out with the old, in with the new! This month the focus is on skincare. Throwing out old items that never get used, stopping bad habits, and focusing on clean, gorgeous skin. I feel like a lot of people subscribe to samples boxes looking for new makeup items and not skincare. If that’s what you’re in for, you might be disappointed this month. However, I thought the box had some good stuff! To start, I’m always in the market for a new hand cream. H20 Plus Hand & Nail Cream is the perfect size for toting around in my purse. My hands are so dry lately, I literally can’t get enough moisture so this will be a staple for me right now. Jane’s Pick All Natural Soaps is a handmade soap with a relaxing scent. I’m excited to try this instead of shaving cream like BB5 suggests! Tree Hut Shea Body Butter in Coconut Lime is a new discovery for me. I’d seen this at the grocery store before but never picked it up. I’m so glad to have my hands on it! It smells so delicious and sinks into my skin while reminding me of being on a tropical vacation. Yum! Swissco Dual sided Facial Pad is a little scouring pad for my face that I can use on off days when I’m not using the Clarisonic. It doesn’t feel as rough as it looks so I bet it will work really well on my face! Bellápierre’s Makeup Base is what I was most excited for in the box. You can use it to transform shimmer powders from shimmery to matte and it provides a waterproof eyeshadow base. You can use it as a concealer for blemishes as well. I was excited to get my hands on this because for $18.99 this is a full size product and already exceeds the price of the box! I found that a thin layer of this as an eyeshadow base worked really well. If I applied too much it caused creasing. 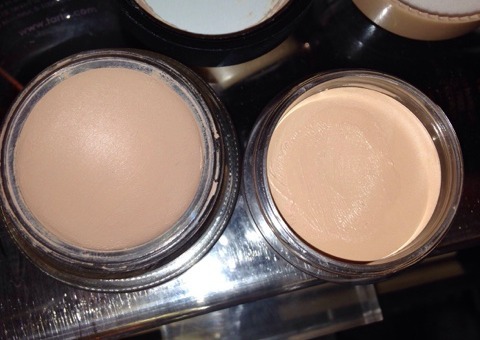 Just for comparison’s sake, I think it’s a little stickier and a little thicker than MAC’s Painterly Paint Pot. The color is also a bit lighter and brighter! I also got an email from BB5 with an awesome coupon code: Spend $35 in their shop and you’ll get $10 off! Use code BB5SPRING before 3/26 to get in on this deal. I can’t wait to see what’s in next month’s box. Do you subscribe?